A definitive book on mindfulness: what it is, where it came from, and why we practice. The mind contains the seeds of its own awakening—seeds that we can cultivate to bring forth the fruits of a life lived consciously. With Mindfulness, Joseph Goldstein shares the wisdom of his four decades of teaching and practice in a book that will serve as a lifelong companion for anyone committed to mindful living and the realization of inner freedom. "There is a wealth of meaning and nuance in the experience of mindfulness that can enrich our lives in unimagined ways," writes Goldstein. In Mindfulness you have the tools to mine these riches for yourself. It’s a cliché that once a popular cultural trend or movement ends up on the cover of "Time" magazine it’s over, officially passé. Mindfulness made its appearance in February. As if that wasn’t enough, everyone from Arianna Huffington to Congressman Tim Ryan has been boldly touting the benefits of mindfulness practice. Scientific studies keep pouring out demonstrating that mindfulness is good for just about anything that might ail us. And in just the last few years, there have been hundreds of books published on mindfulness—applying the practice to everything from child rearing to quilting to business leadership. In the midst of this comes a new book by Joseph Goldstein with the nearly banal title “Mindfulness: A Practical Guide to Awakening” (Sounds True, Nov. 2013). Yet this book is anything but commonplace. It’s a profoundly realized exploration of a traditional source text of Buddhist mindfulness meditation—a landmark work that has the potential to provide the present-day mindfulness movement with the ground and roots it will need to survive its popularity and thrive. You can be forgiven if you don’t know much about Joseph Goldstein. Though he does occasionally travel and teach, Joseph Goldstein has by and large occupied himself as a guiding teacher at the Insight Meditation Society in Barre, Massachusetts—which he co-founded in 1976 with Sharon Salzberg and Jack Kornfield. He also worked to help establish the Barre Center for Buddhist Studies and the Forest Refuge retreat center, both located nearby. IMS has become one of the most prominent meditation retreat centers in the West, with well over 2,500 people attending intensive meditation retreats every year. 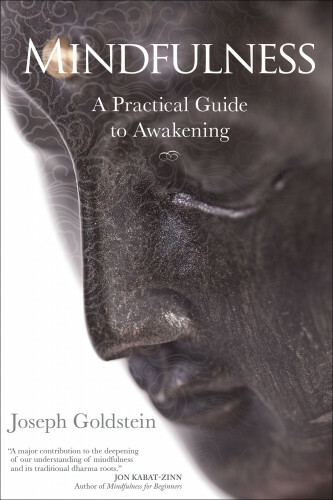 Joseph Goldstein’s new book is an outgrowth of a series of 46 lectures he gave to at the Forest Refuge center that explored the “Satipaṭṭhāna Sutta,” the Buddha’s discourse on the four ways of establishing mindfulness that is found in the classical texts. “The Buddha,” Goldstein writes, “introduces this discourse with an amazingly bold and unambiguous statement: ‘This is the direct path for the purification of beings, for the surmounting of sorrow and lamentation, for the disappearance of pain and grief, for the attainment of the true way, for the realization of nibbāna [nirvana]—namely the four foundations of mindfulness.’ And as we look at this sutta [sutra], we find that all of the Buddha’s teachings are contained within it. With each of these four ways of establishing mindfulness, the Buddha teaches different methods and techniques that liberate the mind. . . . When we open any one door of the Dharma, it leads to all the rest.” In this same way, Joseph Goldstein’s “Mindfulness” is not a commentary on Satipatthana Sutta, rather it explores the text as a means of revealing all of the teachings. With each passage a new door is opened to the Dharma. “Mindfulness” is also interspersed with a wonderful array of quotes from teachers of various Buddhist traditions—a trove culled from Joseph’s readings over the decades. Though over 450 pages, this substantial work is remarkably readable and inspiring—a book to study as well as to flip through and explore. Review for Mindfulness Review by Ed Bastian, Ph.D.